During the past 12 months the AccTech Customer Care Division received 7451 calls from our valued customers (+/- 30 calls logged per day). 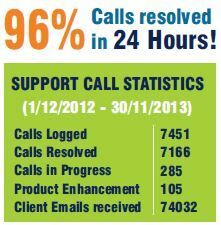 This resulted in a record breaking 48 440 Case Communications with customers and suppliers around the globe. We thank you for your continued support during the past year and wish you a happy and prosperous 2014. Please see the December holiday period support procedures for uninterrupted support services during this time.